Cedar Rapids, IA - The Kernels have released their second annual report showcasing how the organization supported the Cedar Rapids community in 2017. The eleven page report features new community programs "Catch with a Cop" and "Home Run for Hunger" while also breaking down the $256,000 in charitable donations contributed by the Kernels organization. Other highlights include a recap on the thriving "Kernels Summer Reading Program" and a page dedicated to The Kernels Foundation in their efforts in supporting recreational activities for the youth in Eastern Iowa. "The work we do in Cedar Rapids and surrounding communities is something we are very proud of." says Ryne George, Kernels Director of Community Relations. "Back in 2016 we started the "Take the Lead" community relations initiative to help brand our efforts and today it has really grown into a way of thinking here at the ballpark and pushes us to do more." 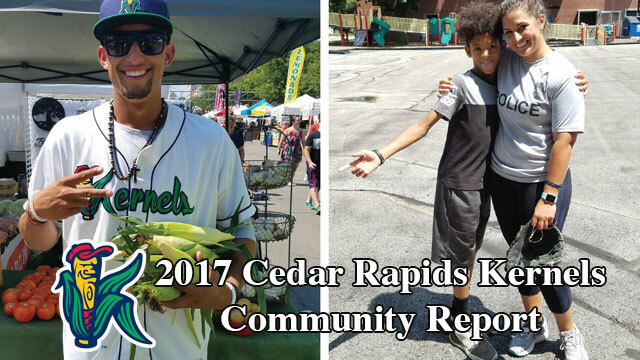 The 2017 Cedar Rapids Kernels Community Report can be viewed by clicking here. The Cedar Rapids Kernels are the Midwest League affiliate of the Minnesota Twins. For more information, visit www.kernels.com and follow the Kernels on social media on Facebook, Twitter, Instagram and YouTube.